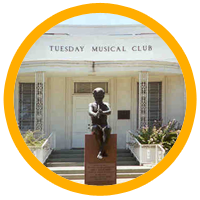 The Tuesday Musical Club was founded in 1901 by five women with the vision of studying, performing and promoting fine music to the San Antonio community. 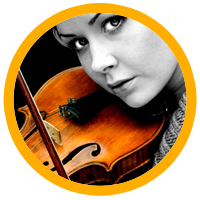 Tuesday Musical Club continues to flourish by bringing the enjoyment of quality music to its members and friends, and still embodies the values of performance and education that were so long ago set in place by its founders. Holding the distinction of being the oldest music club for women in Texas, today there are more than 250 members in the club. 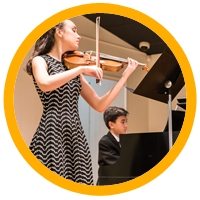 Anyone interested in music as a fine art is invited to attend the club’s Artist Series; the Junior Tuesday Musical Club Competition on Saturday, February 23, 2019; and the Young Artists Competition on March 2, 2019. The public is also invited to the club’s semi-monthly, two-hour meetings with musical performances by local professional artists, followed by a tea. No RSVP required. Click here for schedule of 2018-2019 meetings, which begin at 1:30 p.m.
New members are welcome. If interested in membership in TMC, please contact satuesdaymusicalclub@gmail.com. If interested in renting the TMC Clubhouse for an event, please contact satuesdaymusicalclub@gmail.com. I grew up in San Antonio, and those years were filled with encouragement for me. Tuesday Musical Club is a focal point for dedicated musicians. When you are around others who share your interests, you become exposed to new perspectives, interpretations and technique. This experience expands your understanding and range of possibilities, and piques your curiosity. For me, TMC was a place that kept the flame of my musical interests burning, gave me the opportunity to meet other pianists, and provided me with a platform for performance. For those reasons it was an invaluable place for me growing up; I would not have pursued a career in music without it. What the Tuesday Musical Club is doing for San Antonio is extraordinary and I encourage any and all of you to support such institutions…support them boldly and aggressively. The arts are a subject that concerns all of us (because) truth, beauty and goodness are important to us. The world needs a great deal more beauty.